I have painted, drawn, and made prints of all kinds all my life. I am a Shropshire-born artist, but spent most of my adult life first in North Africa, and then in Liverpool living and working within the community arts scene. Having been away from Shropshire since I was 7 or 8 years old, I finally returned to live in Oswestry in late 1998. My work is usually landscape-based, often abstracted, sometimes incorporating the human figure – I’m interested in how the figure and the landscape reflect the human mind – or maybe it’s the other way around. Various pieces are in national and international private collections. Over the years I’ve done commercial offset litho, screen prints, collagraphs, mono-prints, lino-cuts, woodcuts, and etchings, though these days I am doing almost all acid-based etching. When I paint I generally use acrylic and oil in various forms, and sometimes other mediums. 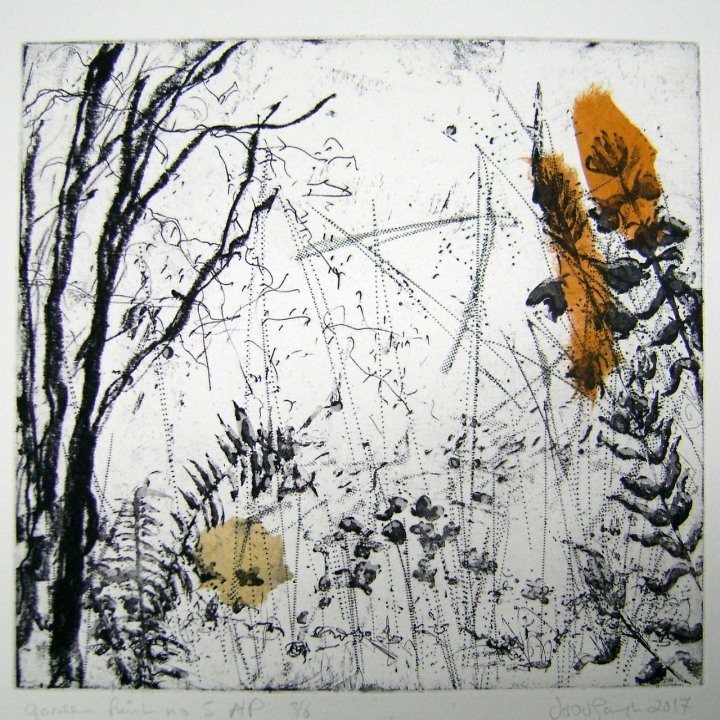 I garden (very important) – and my most recent series of prints, Garden Prints draws upon images of my garden. More recently I’ve also started to explore 3D, and have produced a small number of installations using several different media in each. ‘Metamorphosis’ for instance was based on the landscape and made mainly of clay with shell, bone, wood, ink, graphite, oils and chalk. ‘Giant Beauties’ consists of a number of suspended floating muslin panels (“a small forest of Giant Beauties to wander amongst”). Each one shows one or two giant figures, the giant beauties, drawn/painted in ink, clay slip, sanguine, chalk, charcoal, between 7’ and 9’ high. I am a founding member and currently a committee member of the Oswestry-based Borderland Visual Arts, which has a membership of some 60 artists from a wide range of disciplines and who are based not just in Oswestry, but also out to Shrewsbury, Meiford and Wrexham. I am a team member of the AtoZ for Oswestry Project, which set out 3 or 4 years ago to do something that would help to boost Oswestry’s image of itself. We invited the public to vote for their favourite Oswestrian people, places and things, chose 26 of these and then commissioned 26 local artists to illustrate them. I am one of the two Creative Directors and I was also commissioned with I is for Iron Age Hill Fort, for which I produced an etching. Since the 26 images – paintings in various mediums, prints of various kinds, drawings, collage, a piece of ceramic and an interactive 3D installation – were completed, we have produced postcards of all of them, a 2017 calendar, and most recently a very delightful map of Oswestry and its environs with all the 26 chosen people/places/things marked on it. I love working with like-minded people and so currently run courses on life & portrait drawing and painting, and abstract art, for adults on a regular basis in Chester and Oswestry, plus one-off workshops for a range of arts societies & clubs and community groups.